Bills head coach Doug Marrone announced that the starting QB job was open to competition last week when the team announced they had re-signed Tarvaris Jackson. At the NFL Combine he explained how each of the top two competitors in that forthcoming battle took the news. Buffalo’s head coach also said he’s conducted an evaluation of Fitzpatrick and Jackson on tape, but he’s not going to share his conclusions with the media or the public without talking to the quarterbacks themselves first. That won’t happen until April 2nd when players can report for the offseason conditioning program. Stevie Johnson made his share of interview stops during Super Bowl week in New Orleans. In an interview with NBC Sports Network, Johnson was asked for his thoughts on the Bills for the 2013 campaign and what he wants. As noteworthy as his playoff comment might be it’s perhaps even more telling that the next thing out of his mouth was that players are accountable when things go wrong. He also gave indication that players in the locker room got comfortable with the team’s situation of not being a playoff team. It’s encouraging that he’s out to change that. Johnson also said that Ryan Fitzpatrick is still his guy, but some competition at the position would do nothing but help Fitz. 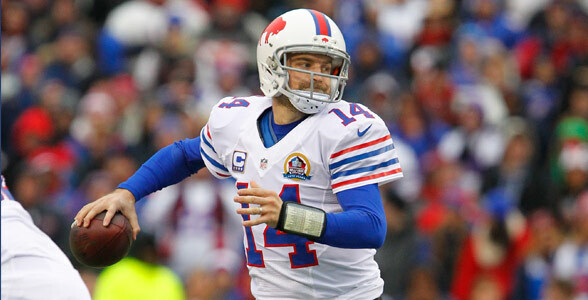 Just one game left in the season for the Bills, and QB Ryan Fitzpatrick will get the start for the finale. Head Coach Chan Gailey said Monday he won’t use the Jets game this Sunday to take a look at either of the other two QBs on the roster, Tyler Thigpen or Tarvaris Jackson. And the Head Coach pointed out that Fitzpatrick had a good day throwing the ball in a losing effort at Miami. Gailey was asked specifically why he would not want to give backup Tarvaris Jackson a shot to play this week. Jackson’s been on the inactive list since he was acquired in a trade with Seattle four months ago. In fact, the Head Coach said he would not use Sunday’s season finale as a chance to give playing time to little-used backups. There were a lot of opinions after the game on Stevie Johnson’s non-touchdown call. We’ve already outlined the referee’s stance on the play. Here’s what the players thought. Buffalo had a few opportunities deep downfield in the passing game. Stevie Johnson had a step on his defender, C.J. Spiller did as well and so did T.J. Graham, but none of their deep shots were completed. They could’ve changed the complexion of the game. Johnson and Ryan Fitzpatrick tried to make heads or tails as to why they’re having trouble connecting. Johnson had only one answer to get it right and hit on some of those big pass play opportunities. Entering Sunday’s game Buffalo ranked 30th in the league in passer rating on passes that traveled more than 20 yards through the air with a rating of 40.3. Very often this season Bills fans have clamored for more deep passes downfield. Buffalo had about a half dozen deep passes called, but could not connect on any of them in Sunday’s loss to Seattle. Ryan Fitzpatrick just missed Stevie Johnson, T.J. Graham and C.J. Spiller on deep throws that could’ve dramatically changed the complexion of the game. Head coach Chan Gailey in his weekly appearance on WGR Sportsradio 550 Monday morning offered comment on the game plan and taking deep shots down the field in the passing game. The won-loss record isn’t doing much to reinforce it, but head coach Chan Gailey and his team believes they are an improved team from last season. Ryan Fitzpatrick was also adamant that the team has improved. “The one thing that really matters at the end of the way is wins and losses. I think we all know that,” said Fitzpatrick. “Me, especially, as a quarterback, the only thing I’m measured in are wins and losses. Not being where we want to be right now, a lot of that falls on me. I’m 100 percent fine with that. I haven’t played as well as I wanted to play this year. Unfortunately, our win-loss record is where it is and a lot of that falls on me. After the Bills wrapped up the 2011 season with C.J. Spiller exploding onto the scene over the last six games of the year in place of the injured Fred Jackson, it led to the decision by Chan Gailey and his staff to change their offensive approach. Instead of going to a largely spread attack much like the first two seasons, Gailey and his offensive assistants chose to lean more heavily on their two dynamic backs, an approach that the Bills head coach had not previously adopted in his NFL career. In his offensive coaching career Gailey had leaned on one feature back whether it was Bobby Humphrey in Denver, Jerome Bettis in Pittsburgh or Emmitt Smith in Dallas. Obviously injuries to Jackson at three different times this season compromised those plans this season. Ryan Fitzpatrick acknowledged that their approach did shift from a wide open spread attack to an offense that was designed to run it more. With Jackson in and out of the lineup with two knee injuries and a concussion it compromised the offensive approach for 2012 and has left the Bills still searching for a true offensive identity. Despite the struggles on offense of late, Gailey believes his decision to make use of both Jackson and Spiller as much as possible was the right call. Closing out tight games has proven difficult for the Bills. They did kneel out their five-point win over Miami and they killed the clock in their Week 3 win at Cleveland, but they’ve found it tough to hang on to leads in some other close games and it has the players wondering about their killer instinct. Last week the Bills practiced outside on Thursday to take advantage of the windy conditions, knowing they’d be close to the windy conditions last Sunday against the Jaguars. This week they’re doing much of the same as they’re practicing outside here on Thursday this week at One Bills Drive. Right now Sunday’s forecast is rain, high of 41 degrees with sustained winds of 10-15 mph. The Bills have had their share of slow starts on offense this season, which is why they had a tempo change planned for Sunday’s game against Jacksonville. But Buffalo never put that plan into action after posting a touchdown on their opening drive, in a rain soaked game where weather also was a factor. Making his weekly Monday morning appearance on Bills flagship WGR Sportsradio 550, Chan Gailey admitted that the no huddle was a significant part of their offensive game plan for the Jaguars. Gailey acknowledged that the weather was also a factor. Ryan Fitzpatrick is excited to use no huddle at some point this season, as it was to be something they intended to turn to a decent amount this year. 30 pass attempts a key number? The Bills won-loss record after Sunday’s victory is now at 5-7 on the season. What’s interesting is their won-loss record when using 30 pass attempts as an over-under barometer. When Ryan Fitzpatrick has fewer than 30 pass attempts in a game in his career with the Bills, Buffalo is an impressive 15-7. Obviously part of this winning percentage is due to the team typically having a lead in such games and being able to run the ball more and throw the ball less. This past Sunday’s win is part of that total when Fitz attempted just 17 passes on a wet and rainy day at Ralph Wilson Stadium. The team had the lead and the defense was in control. When Fitz attempts 30 passes or more in a game Buffalo is 5-22. Now there are a lot of factors that go into that too. Fitz is usually throwing more when the team is behind on the scoreboard already, so naturally a good number of those games when he’s got more than 30 pass attempts are going to wind up being losses. Nevertheless it’s an interesting winning percentage to examine knowing Buffalo has to win out to have any shot at the postseason. Former NFL executive Charlie Casserly has an impressive resume. He was part of four Washington Redskins Super Bowl teams. He spent 16-years in the league as General Manager of the Redskins and the Houston Texans. And now he’s an analyst for the NFL network. And Casserly has some strong opinions on Bills Head Coach Chan Gailey. Casserly made the comments in a discussion on the radio about the recent struggles of quarterback Ryan Fitzpatrick. The former architect of the Redskins and Texans teams says Gailey and his coaching staff have tried to rein in the “gunslinger” tendencies that sometimes get Fitzpatrick in trouble. After Casserly said Gailey is one of the best coaches in the league, host John Murphy asked the former GM to elaborate. Casserly is no stranger to withering criticism from NFL fans. He was vilified in 2006, when he was GM of the Texans, and the team chose DE Mario Williams with the first overall pick. RB Reggie Bush and QB Vince Young were considered the better choices by fans around the league. And Casserly says the Bills would be making a mistake if they make major changes in their football department. Casserly was asked if Bills fans could reasonably expect to be patient, after 12-years without a playoff berth, and possibly a 13th. Bills QB Ryan Fitzpatrick has discussions with head coach Chan Gailey each and every week after Gailey and his staff formulate the game plan. Fitzpatrick shed some light on the ways they interact and discuss what utilized most and least in the game plan each week. With respect to the game plan Fitzpatrick says after it’s put together by the staff Gailey and he discuss the elements of the offensive plan. Bills head coach Chan Gailey was asked if Buffalo’s season and performance on offense doesn’t improve could it have an impact on Ryan Fitzpatrick’s status as the team’s starting quarterback. Here was Gailey’s response. When asked why he believes that Gailey followed up. Fitzpatrick was asked the same question about his hold on the starter’s job if his performance doesn’t improve down the stretch. Bills fans may disagree, but Stevie Johnson isn’t giving up the ship when it comes to Buffalo’s playoff hopes despite a 4-7 record. Ryan Fitzpatrick didn’t stick his neck out quite as far as his top receiver, but is committed to keep fighting for wins. Currently three other AFC clubs are 4-7, the Dolphins are 5-6 and the Steelers, Bengals are 6-5. With the win Sunday Indianapolis is 7-4. Colts interim head coach Bruce Arians said going into Sunday’s game that he considered Buffalo the best screen team in the league. That healthy respect for the Bills screen game had Indy’s defense ready to neutralize it. Screen passes have been an integral part of Buffalo’s offense this season and not many teams have had much success stopping it, but the Colts did, mainly by grabbing the receiving targets and impeding their progress. Arians admitted after the game that they were lobbying with the officials to keep an eye out for the Bills sending an illegal man downfield to block on the screens. In the end Ryan Fitzpatrick had to throw some designed screen passes away as the Colts either chucked the receiving targets or got hands in the passing lanes with their pass rush. Knowing the copycat league that it is the Bills can expect that their future opponents including the Jaguars this week will pay very close attention to what the Colts did successfully to stymie Buffalo’s screen game.